With the myriad of portable Bluetooth speakers on the market these days, it’s easy to get lost in the mix. Nyne has done an exceptional job at creating a product in this category that stands out above the rest. With that being said, the Nyne Mini Portable Wireless Bluetooth Speaker is just as easy to carry around as your phone and yet delivers big sound from a small package. The first thing that I noticed about the Nyne Mini is the quality of its packaging. Unboxing it is a very Apple-like experience, with the way the lid pulls off very slowly as if it’s held in place by a vacuum. It struck me that a company that cares that much about its products’ packaging is very likely paying attention to detail in all aspects of their product lines. The Nyne Mini, at just 5″ x 2.5″ x 2.25″, is actually shorter than my iPhone 6s Plus, making it really easy to carry around. 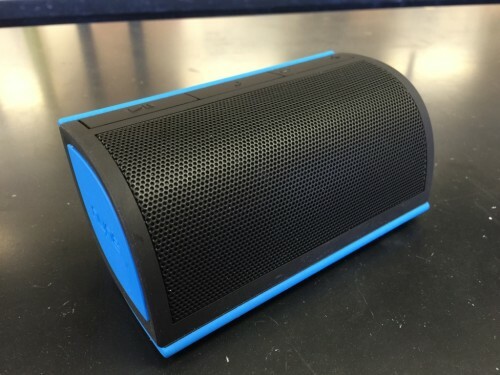 The rubberized, silicone exterior also provides the speaker some protection from bumps and abrasions and gives the speaker a nice non-slip grip when picking it up. I also like the placement of the playback controls on the top of the speaker. Making changes in volume, tracks, or answering phone calls is much easier with the controls in this position. 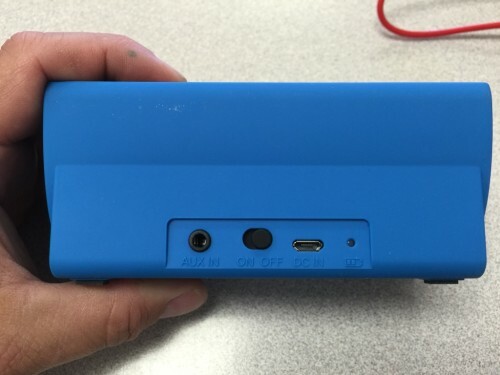 The rear of the Nyne Mini has ports for the provided auxiliary cable and charging cable. The back also has an on/off switch and a battery indicator light. A handy neoprene case fits snugly on the speaker, allowing you to take your music with you while keeping your speaker dust and moisture free. I’ve found this to be an especially useful feature when taking the Nyne Mini for a ride in my boat out fishing or with my family. There are two ways to play music with the Nyne Mini. You can simply plug the speaker into your iOS device’s headphone jack with the provided auxiliary cable. This option seems to produce the best sound, being directly wired to the speaker itself. You can also wirelessly connect the Nyne Mini to any Bluetooth-enabled device, freeing you up to use your device for other uses while still listening to your favorite music. 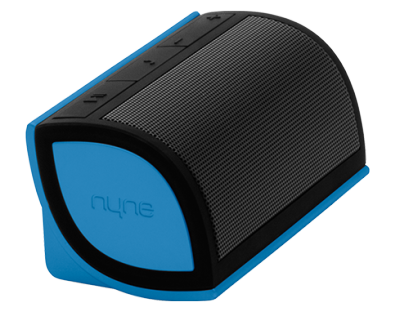 As a Bluetooth device, the Nyne Mini also has a built-in microphone to allow you to answer calls, using the Nyne Mini as a speakerphone. A pleasant blue light installed behind the speaker grille allows a user to quickly see if they’re connected. 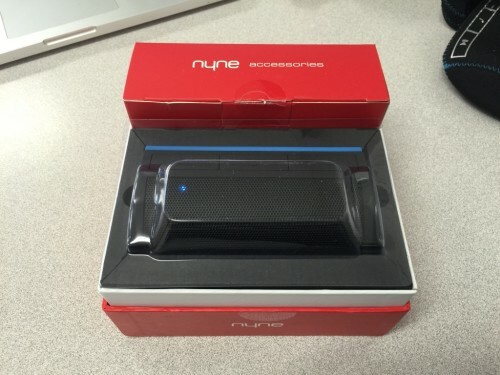 I’ve been using the Nyne Mini Portable Wireless Bluetooth Speaker for several months and I like it a lot. It sounds great for such a small speaker, and Nyne’s attention to detail makes it a pleasure to use. If you’re on the market for a compact portable speaker, you would be hard-pressed to find a better option than the Nyne Mini.